How can Reincarnation be accurate? When dealing with a question of this nature let us start off with a ‘test case’. Let’s say that of a baby who is born, screams one scream and then dies. What will happen to this infant? Why was it born? To what purpose was its life? If we go with the Muslim understanding, this baby was born, and Islam provides that it will go to heaven. But if it was only to live for an instant (as many babies do) why did God bother sending it? If this baby will go to heaven and share a spot with the greatest of Shaheeds (martyrs) who had to struggle through life, is this justice? Why was this baby given such a short life (ie. a short test) while the Shaheed was given such a difficult test when the result will be the same i.e. heaven? If you say that the Shaheed will have a higher level in heaven then I ask where is the justice in that? The baby wasn’t given an opportunity to get to a higher level. If you take the Sikh approach, the baby was born due to karma (the law of action and reaction). It had the karma to have lived such a short life and now it will be reborn. The cycle of birth and death continues until the soul attains union with God while alive through Naam and devotion. After this, the soul is forever united with God in Sach Khand and reincarnation is finished. This is a system of total justice. Why are some born with so many problems be they poverty or physical handicap, etc. while others are born with so many advantages? Where is the justice in this? If the reward is the same (Paradise) why is the test different for different people. This is an inherent injustice. If the reward is not the same (different levels of Paradise) then once again it is an injustice as not all have the same opportunity to achieve the higher levels. Even the concept of Muslim after-life is an affront to spirituality. The Muslim afterlife of Paradise is an enjoyment of worldly pleasures like rivers of milk and wine and beautiful attendants. These are physical pleasures that are even possible on this Earth if someone has the resources to create them or you just have to travel to your local supermarket and buy as much milk and honey as you desire! Sikhism believes in the existence of Heavens and Hells but not as permanent places as in Islam and Christianity. The soul may enjoy these places for a time as a reward but then must be sent back into reincarnation. The ultimate goal is Sach Khand which is far greater than any Heaven. It is a state of UNION WITH GOD in which the soul forever enjoys SPIRITUAL bliss. Not physical pleasures. At any rate, karma is not necessarily a positive-reinforcement process. Bad karma will lead to a negative outcome while positive will lead to a positive. Quite simple! The way Sikhism differs from Hinduism however is that the human is NOT A SLAVE TO KARMA. The way to break out of karma and reach God is through Naam meditation. The source of ‘evil’ is a separation from God. The soul has the light of God but when the individual is not aware of this, he sees himself as a distinct entity. Independent of all others in creation and will do anything to benefit himself even if it is destructive to others. But a spiritual and God-oriented soul will see that light within himself and in others and will not act selfishly. I have already shown you how the real injustice is in the Muslim understanding of birth and death. It is in fact a system that lacks mercy as well because one who makes a mistake is never given a chance to repent or reform. If someone never has heard of Islam or God, how can they be judged? The system is intrinsically unfair to them. However in the Sikh understanding, even if someone does not know about Sikhism or does not realize God, they can have the opportunity in the future. There is compassion and mercy in this system because God is always forgiving and no soul is forever condemned to Hell. There is always a chance for reform where there is the will. You bring up the fact that past lives are not recalled. This is for the benefit of the individual. We have enough trouble managing just this one life, if we could recall countless past lives, imagine how much more trouble that would be. Instead of a duty to our immediate family we would have duties to so many parents and siblings, etc. At any rate, reincarnation is not a punishment as you have made it out to be so much as it is a continuation of the soul’s journey. Based on past karma, the soul is placed in a certain situation. Perhaps due to past karma the soul is placed in a situation of total poverty. Whatever the soul decides to do in that situation (earn money through hard work or become a thief, etc) is the source of new karma. So characterizing reincarnation as punishment is incorrect. It is simply the soul proceeding on its journey. 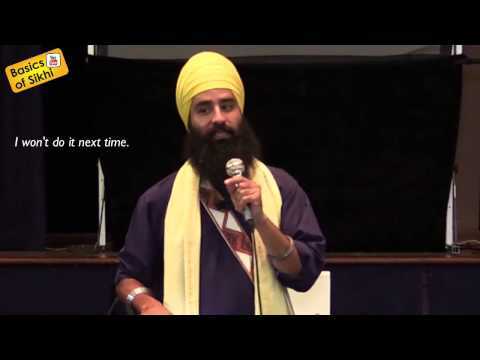 « Why did Guru Nanak’s own son abandon Sikhi?